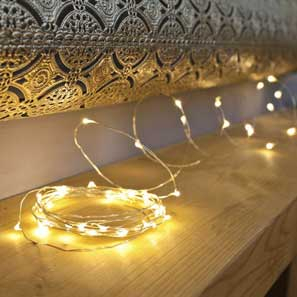 PowerBee's Great Value Decorative and Operational Lights Powered by Batteries cover everything from Fairy Lights for the Bedroom, to Security and Wall Lights for Outdoors. Battery Lights Give You flexibility to place lights where You need, Easy to Fix and change Batteries, You can Light up virtually anywhere You want with Battery Lights. We have selected Easy Change Batteries, Simple ON / OFF / AUTO Functions to make Setting the Lights Very Easy. Battery lights use Micro LED or SMD LED's and some Utilise Timers to Ensure they Operate a Much Longer period of Time. Want Battery Lights that Operate for Longer but dont cost the earth? Our Range Offers True Value for Money. Our Famous PowerBee Lights have been Personally chosen and Tested over Years, they will Outperform nearly All Other Led Lights in their Price Range. We Offer the Best Prices for Battery Lights whilst Ensuring their Quality is Optimum. Where Can Battery Lights Be Used? You can Use Battery Powered Lights nearly anywhere around your home and garden. You can use them Indoors to decorate windows, mirrors and dressers in bedrooms, or Outdoors in Your Garden Patio Area, Pergolas, Bushes, and Trees..
Did You Know : Rechargeable Batteries can now last 5 years stored in a drawer? Its True we have moved on, that's why battery lights are now becoming so popular, with easy to change batteries, a variety of different ways to fit them including 3M stick pads. Battery operated lights use their own battery which allows them to function at any time you choose. Just Simply insert charged batteries, turn them on and select the mode that you want.